It's been a long time coming but finally OS4 has arrived (albeit in pre-release form). Not only do we have a new OS but we also have new hardware in the guise of the AmigaOne. But those nice guys over at Hyperion haven't forgotten about us "classic" users who have invested a lot of money in the PPC accelerator cards and so OS4 is also coming to the classic Amiga! 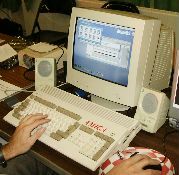 The "classic" version of OS4 is still in closed beta testing but is quite advanced and is running on both the CyberStorm PPC A3/4000's and Blizzard PPC A1200's. Being PPC native, the OS needs more RAM than previous versions of AmigaOS but it is still lean and efficient, as we have come to expect. It will boot from 3.0 ROM's and can handle Zorro cards, clockport adapters, PCMCIA devices etc. through the existing 68k drivers. PCI busboards also use their own 68K software to work with OS4. Eventually these expansion systems will be handled by OS4 native drivers. This will mean that PCI cards such as soundcards, IDE boards etc. will then work using the native drivers already available on the AmigaOne. Installing OS4 is as easy as can be and the final end user version will come with a robust install script just as you would expect from a professional operating system. Once the OS is installed and on your hard drive all you need to do is set the partition it resides on to be bootable and do a cold boot, then watch the wonder that is OS4 boot. Almost as soon as the boot process starts the 68k CPU gets disabled and the whole shebang runs from the PPC. In a short period of time OS4 is up and running on the classic. To begin with the OS is running in an AGA screenmode so it looks a bit dated and is a little bit sluggish. However it does feel faster than OS3.9 on AGA, it looks better and even screen dragging still works on AGA! I was quite pleased to see that OS4 still has access to the AGA chipset, this means a fair amount of old software that needs AGA will still run, which is rather nice. Of course, most users will immediately select a graphics cardscreenmode which uses the PPC native Picasso 96 drivers included with OS4. When I say "classic" version what I mean to say is just OS4. You see, there is very little difference between the OS4 than runs on the "classic" and OS4 than runs on the AmigaOne. The only real change is kernel and the contents of the Kickstart directory as well as a few device drivers. Pretty much everything else is the same. This means "classic" users will get all the features you've read about in the OS4 reviews and updates. Every beta release that goes out to the beta testers applies to "classics" as well as the next generation hardware. In terms of performance OS4 does very well. I have a 166Mhz 603e, or BlizzardPPC to the likes of you and me. I also have a BVision graphics card and 128MB of fast ram. Everything else is pretty standard. I still use Paula for audio, the internal IDE port for my hard drives etc. You can really see the speed increase once you boot into OS4. The graphics system is PPC native, just like on the A1 so things like opaque window resizing/moving are fairly smooth. Loading of applications is faster because the filesystem is native. PPC native applications themselves perform better. YAM even downloads my e-mails faster now it's running native on the PPC. Personally I think AmigaOS4 is great. It feels exactly like the OS I know and love, that's probably because it is the OS I know and love! To me it's the natural progression to the OS I've been waiting years for. It is now my primary OS, I only need to drop back into OS3.9 once a week or so when I need to use 68k intensive applications like Wordworth. Hopefully soon, when Petunia is integrated, I won't need to drop back at all. It's nice to breath a little more life back into my classic Amiga which has served me so well for so long, and now I'm looking forward to a few more years yet. But I still don't think it's going to stop me from doing my utmost to get my hands on a new Amiga, an AmigaOne!